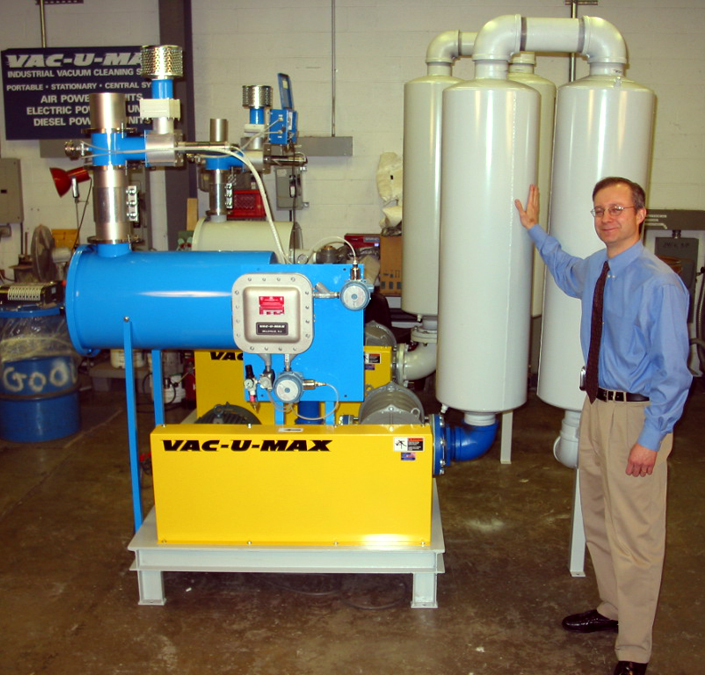 Vacuum pump packages are recommended for the higher rates over longer distances and continuous service. They are also used on many applications where a venturi unit would be adequate but sufficient compressed air is not available. 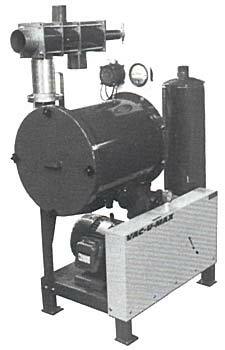 They feature a positive displacement lobe-type blower and are complete packages with motor and blower, secondary material filter on the inlet and muffler on the outlet. These units are mounted on a heavy duty, forkliftable base and are equipped with belt guards conforming to current OSHA standards. Included are a glycerin-filled vacuum gauge and a vacuum relief valve. The secondary filter protects the pump from any carryover of material from the material receiver. Cartridges are easily changed by removing the end cover. Optional differential pressure gauge and/or switch can be furnished to indicate or shut down if filter should become restricted. 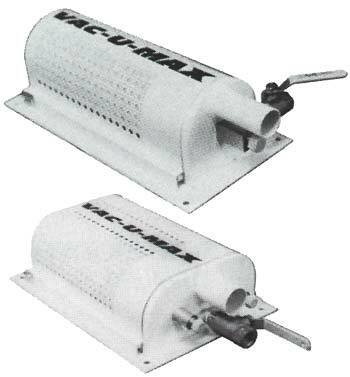 These highly effective, quiet power units are a VAC-U-MAX innovation. They are ideal for low rate, intermittent use where sufficient plant air is available when required. Simple in construction and operation, the venturi power units have no moving parts and thus require minimum maintenance. 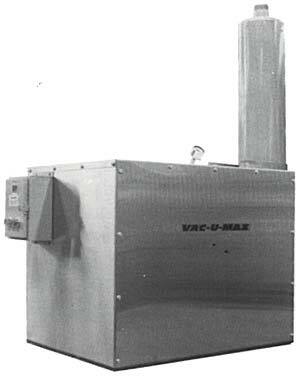 Regular shop air, reduced to 60 psig, is passed through the venturi, developing a powerful vacuum which draws air and material through the conveying lines. Variable orifice normally set for 8" HG vacuum can be adjusted to a maximum of 16" HG. Venturi power units are available in single to quadruple venturi versions. Cycling can be controlled manually with a manual air control valve or automatically utilizing an air control valve actuated by a timer control panel or by a signal from other control devices. A patented muffler system keeps sound levels well below OSHA limits. Venturi power units require no electrical connections; never run hot, even when "dead ended". Ideal for explosion hazard areas. Can be mounted practically anywhere - on a wall, post, machine, vertically, horizontally, etc.